PNY Technologies, a global leader in flash memory cards, USB flash drives, solid state drives, high speed HDMI cables, computer memory upgrade modules, consumer graphics cards, and professional workstation graphics cards, today announced the XLR8 GeForce GTX 570 1280MB GDDR5 graphics card. 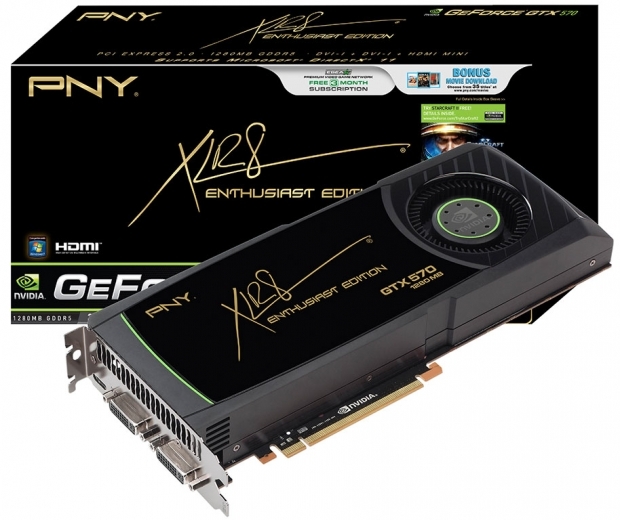 PNY’s XLR8 GeForce GTX 570 Enthusiast Edition offers incredible performance and stunning gaming effects. With cutting-edge Microsoft DirectX 11 technology and full support for all the premium GTX gaming technologies, such as NVIDIA Surround, 3D Vision, PhysX, and SLI, the GTX 570 screams performance. PNY’s latest graphics card also features the new innovative thermal design for a quiet gaming experience. The GTX 570 delivers a fully immersive stereoscopic 3D experience, for the ultimate in PC gaming. Consumers who purchase the PNY GTX 570 will receive a promotional code for a trial version of Blizzard Entertainment’s recently released StarCraft II: Wings of Liberty. Users can indulge in the critically acclaimed sci-fi strategy game for 14 days or 7 hours of game play, whichever comes first, but must be redeemed before January 31, 2011. This exclusive opportunity allows users to experience a sneak-peak of the full game, valued at $59.99 MSRP. The PNY GTX 570 graphics card will also feature a bonus full-length movie download from Sony Pictures Home Entertainment. Consumers have their choice of over 35 movie titles from a broad selection of genres including Action/Adventure, Drama, Comedy, Romance, Sports, and Family. The bonus Sony movie downloads include recent blockbuster hits as well as favorite classics, such as Crouching Tiger, Hidden Dragon; Big Daddy, As Good As It Gets, 21 and S.W.A.T. Additionally, consumers who purchase a PNY GTX 570 will receive a bonus 3 month subscription to ESports Entertainment (ESEA) Premium Video Game Network. ESEA is a video game solution provider, specializing in community tools, proprietary anti-cheat technology, custom server modifications, and an extensive network of premium game servers. Users can learn, play, practice and compete all with an ESEA Premium subscription.